Tobacco was first introduced in Europe by Spanish and Portuguese explorers of America in the early 16th century. The different ways in which tobacco is used lead to considerable variation in appearance, site and frequency of the lesions associated with the tobacco habit. In Western countries, cigarettes, cigars and pipes are the major ways in which tobacco is used, but chewing tobacco and snuff dipping (smokeless tobacco) have become more popular in recent years. Despite the attention given to tobacco as a major etiologic factor in leukoplakia, epithelial dysplasia and squamous-cell carcinoma, several other tobacco-associated lesions are known. Although malignant and nonmalignant lesions associated with tobacco use are discussed separately in this article, tobacco use could result in the presence of more than one type of lesion in any individual patient. The major nonmalignant oral lesions associated with the tobacco habit are described under dental, gingival and mucosal conditions. A dark brown to black discolouration of the cervical margins of teeth caused by tar and other by-products of combustion is commonly associated with smoking. Other concomitant causes of extrinsic staining, such as dietary substances (e.g., coffee or tea), may contribute to the discolouration. The history of a tobacco habit helps in determining the correct diagnosis and etiology. Although deposits are primarily of esthetic concern, they may also promote plaque accumulation. Treatment consists of mechanical polishing with mild abrasives. However, the stains will quickly reappear with continued tobacco use. Specially formulated toothpastes or home use tooth-whitening systems can be useful adjuncts in the removal or masking of tobacco stains. Pipe smoking and the use of smokeless tobacco are commonly associated with tooth abrasion. Abrasion from pipe smoking occurs on the occlusal surfaces in association with placement of the pipe stem, whereas abrasion from smokeless tobacco usually occurs on the vestibular surface opposite the wad of smokeless tobacco, but may involve the occlusal surfaces if the tobacco is chewed. Abrasion may result in dentin hypersensitivity, pulp exposure or apertognathia (open bite). Apertognathia develops in pipe smokers and usually occurs unilaterally on the smoker’s favourite side. Individualized treatment may include dentin desensitization, endodontics and crowns. Acute necrotizing ulcerative gingivitis (ANUG) is a painful and rapidly progressive disease of the free gingiva, attached gingiva and alveolar mucosa characterized by necrosis of the gingival papilla accompanied by halitosis. ANUG primarily affects young adults who smoke heavily and have poor oral hygiene. Although the exact interaction between ANUG and smoking is not clear, local and systemic effects have been suggested. The progression of ANUG may be enhanced by plaque accumulation in sites with tar deposits and tissue ischemia secondary to nicotinic vasoconstriction. Without treatment, ANUG may occasionally progress to involve the marginal alveolar bone. Initial therapy for cases uncomplicated by bone involvement includes debridement under local anesthetic, instruction in oral hygiene and increasing awareness of the role of tobacco. Dramatic resolution of gingival lesions is often seen within 48 to 72 hours with these measures alone. Antibiotics, when indicated, should be considered as adjunctive to local debridement. Penicillin and metronidazole are both effective in cases of severe ANUG or where debilitation is known or suspected. Frequent follow-up is necessary until the interdental papillary contour returns to normal. If this does not occur, periodontal surgical intervention may be necessary. Although gingivitis and periodontitis are caused by bacteria, smoking has been strongly implicated as a risk factor for the initiation and propagation of periodontal diseases. Smoking has been associated with increased calculus deposition, which can accelerate plaque accumulation, recession and deepening of periodontal pockets. The prevalence of periodontitis is greater in smokers than nonsmokers and the alveolar bone is more susceptible to resorption in smokers. Several biologic mechanisms have been suggested. Smoking has been implicated in impairing normal host immunity in terms of neutralizing infection, in adverse effects on neutrophil function and in reducing gingival blood flow. Cigarette smoking has been associated with impaired healing and less improvement in pocket reduction following simple pocket-reduction surgery. Smoker’s melanosis occurs in 25 to 31% of tobacco users and is characterized by discrete or coalescing multiple brown macules that usually involve the attached mandibular gingiva on the labial side, although pigmentation of the palate and buccal mucosa has also been associated with pipe smoking. Smoking-associated melanosis is due to increased melanin production by melanocytes and its deposition within the basal cell layer and lamina propria. The microscopic appearance of melanosis is essentially similar to that seen in physiologic pigmentation or a melanotic macule. Other entities to consider in differential diagnosis are racial melanosis, melanosis due to medications, Peutz-Jegher’s syndrome, Addison’s disease and early melanoma. Smoker’s melanosis is benign and not considered to be precancerous, but a biopsy may be indicated to rule out more serious conditions, in particular melanoma. A gradual return to normal pigmentation over several months to years has been reported following smoking cessation. Burns and keratotic patches are common on the lips at the site of habitual cigarette smoking, particularly where the cigarette or cigar is retained as a stub for lengthy periods. The lesions characteristically appear on the mucosal surface of the lower and upper lips at the site at which the cigarette is held. They are characterized by flat or slightly elevated whitish areas with red striations. Cessation of smoking is the required treatment. Lesions induced by smokeless tobacco characteristically have a wrinkled surface that ranges from opaque white to translucent and are located in the area where the snuff is held. Such lesions usually resolve within a week of cessation of tobacco use. A thorough history is important in establishing the correct diagnosis; however, a biopsy may be required to rule out carcinoma or precancerous changes, especially if the lesion is associated with induration, ulceration, erythema and nonresolution within 2 weeks of stopping tobacco use. Hypertrophy of filiform papillae and retardation of the normal rate of desquamation on the dorsal surface of the tongue produce a hair-like appearance. A black hairy tongue is mainly seen in people who are heavy smokers. Clinically, the hairy tongue usually begins near the foramen cecum and spreads anteriorly and laterally with elongated filiform papillae reaching several millimeters in length. Individuals are usually asymptomatic, but may have a gagging or tickling sensation if the papillae become particularly long. A biopsy is usually not necessary for diagnosis due to the typical presentation. Scraping or brushing of the tongue and smoking cessation enhance the resolution of this problem. Trimming of the papillae may be required in extreme cases. Nicotinic stomatitis occurs almost exclusively in heavy pipe smokers and rarely in cigarette or cigar smokers. It characteristically occurs posterior to the rugae as redness on the palate, which later assumes a grayish-white and nodular appearance due to periductal keratinization of the minor salivary glands. A characteristic finding is the appearance of multiple red dots, which represent the dilated and inflamed duct openings of the minor salivary glands. Thermal and chemical agents acting locally are responsible for the occurrence of this condition. Nicotinic stomatitis is not considered to be a precancerous lesion. The treatment of choice is smoking cessation. Painful palatal erosions due to heavy smoking may occur in addition to nicotinic stomatitis. The erosions are due to the elevated temperature in the oral cavity for a long period. Thickening of the epithelium and white lesions may also occur. Cessation of smoking and a biopsy must be performed to rule out epithelial dysplasia or carcinoma. The relationship between smoking and leukoplakia is not always clear. Leukoplakia of the oral mucosa can occur in patients who have never smoked. 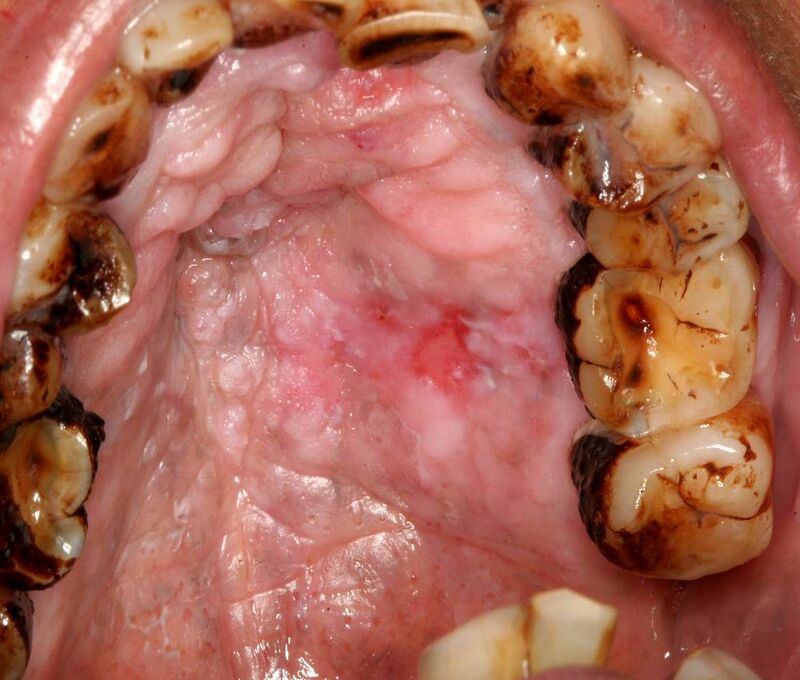 Although cessation of tobacco use can sometimes result in resolution of tobacco-associated leukoplakic lesions, persistence of these lesions is not uncommon and this may reflect malignant transformation. A large number of oral carcinomas are associated with precursor lesions of leukoplakia; 3 to 6% of leukoplakias undergo malignant transformation, with this frequency increasing with longer follow-up periods. The presence or absence of malignant change in a lesion of oral mucosal leukoplakia cannot be reliably determined by visual examination. Limitations are also associated with commercially available toluidine blue screening kits, such as high false-negative staining rates for carcinoma in situ, moderate to severe epithelial dysplasia or both. Thus, screening for oral cancer by toluidine blue methods is not recommended. Lesions suspected of being malignant or premalignant should be investigated by prompt incisional biopsy regardless of staining reaction to toluidine blue. However, toluidine blue may be of some use in selection of the biopsy site when the patient has multifocal lesions or when a lesion is larger than 3 cm. The treatment of choice for leukoplakia is the cessation of any tobacco habit. In cases of leukoplakia associated with smokeless tobacco, the lesion almost always disappears when the use of snuff or chewing tobacco stops. Leukoplakia in a patient with a tobacco habit should always be biopsied to determine the presence of epithelial dysplasia or a carcinoma. Epithelial dysplasia is a neoplastic transformation of epithelium without invasion into the connective tissue. The severity of epithelial dysplasia is determined by the degree and extent of architectural and cytologic changes within the epithelium; categories are mild, moderate or severe. Epithelial dysplasia may appear clinically white or red, due to hyperkeratosis or epithelial atrophy, respectively. Epithelial dysplasia that involves the full thickness of epithelium but does not invade the connective tissue is termed carcinoma in situ. Patients with mild or moderate dysplasia have a significant, but not absolute, potential for reversibility and can be managed with the elimination of the suspected etiologic factors. Patients with severe dysplasia or carcinoma in situ have a low potential for reversibility and should be managed by complete surgical excision of the lesion(s) using a regular scalpel followed by histologic examination of the excised tissue. Surgical ablative techniques such as electrosurgery, cryosurgery and laser surgery may be employed; however, with these methods no tissue is obtained for postsurgical histologic margin assessment. This disadvantage can be partly overcome by carrying out an immediate preablative biopsy of the margins but this approach does not solve the problem of detecting microscopic foci of early invasive carcinoma that can be easily found by postsurgical microscopic examination of the entire excised lesion. Postoperative management includes long-term follow-up with regular monitoring for signs of malignant transformation and programs for cessation of tobacco use and alcohol abuse.